I am happy to say that all aspects of an RK whip are made by yours truly. 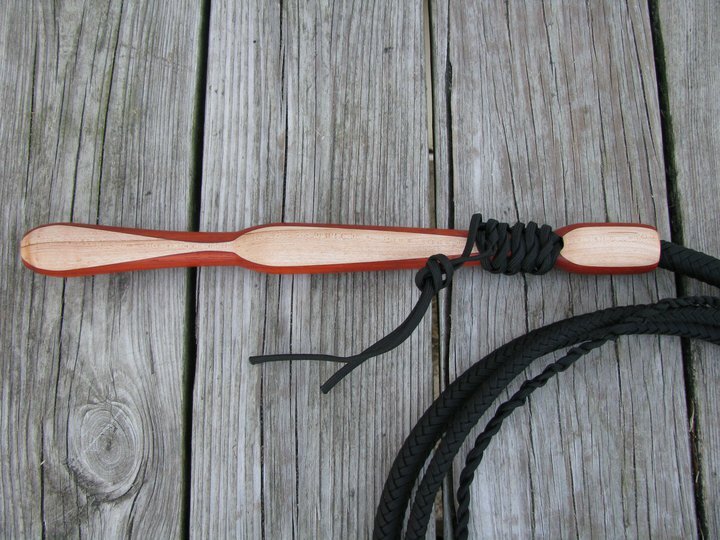 While some plaiters farm out the making of their handles to other craftsmen, I still do my own work so each whip is my craftsmanship from top to bottom. Below you will find some samples of my work and some of the types of wood I have available. The prices vary by wood. Contact me for more details if you are interested in a particular kind of handle. None of the handles on this page have had any stain put on them. They were turned, sanded, polished, and sealed with beeswax; nothing more. Check back often as I plan to add more pics of different types of wood. I am ready to place the order, thanks for your quote. I have a few ?s for you that I want the awnser to as soon as possible. 1. what is a KOTCS bullwhip? 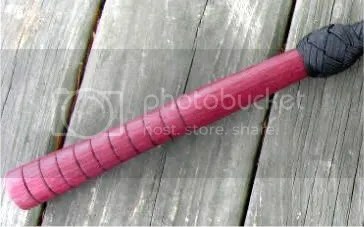 2. where do you get your exoite wood handles? 3.where do you get your para cord? I purchased a whip from you a couple of years ago..LOVE IT…Had lots of compliments on it. Had two other friends purchase from you also. I want a quote on a 6 ft., fancy platted, blue and orange whip. (It’s for my young daughter). Just finished my first 8 foot cow whip thanks to the great tutorial DVD I got from you. still need to wax it, attach a cracker and handle, and it’ll be done! speaking of handles, do you have any exotics in stock? I really need to get a handle, as I have no way to turn my own at this time. if not in stock, what is the wait time for a handle? Hi, im looking to make my own whip and am getting together my supplies. I got your dvd and info from ubraid it. How much, how long for a handle? I like the Zebrawood, Black/Brown Stratabond,. I live in Wisconsin so the weather here is humid and wet in the spring and fall what stand up for that?